Come see just how fun any trip can be when you choose to camp and travel with this triple slide out 3408 Bay Star class A motor home! The full wall slide out along the road side helps to open up the floor space throughout this model. You will find sleeping space for up to six people, plus in the front living area there is plenty of seating space at the 87" jack knife sofa, the dinette, and both the driver and passenger seats swivel around for added seating. You can quickly prepare a snack at the dry bar. In the spacious bedroom there is an overhead TV, a queen bed, and plenty of storage. Get ready for any road trip with a Newmar Bay Star class A motor home! Along the exterior there is a Masterpiece full painted graphics with clearcoat finish plus a DuraShield protection on the front cap which is sure to turn heads as soon as you enter the campground! Inside each model you will find Calypso Glazed Maple cabinet doors, solid surface counter tops in the bathroom and bedroom, plus Flexsteel deluxe leather sofa and front seats. Your trips are made easier with the 10 cu. ft. Norcold refrigerator and the 30" over-the-range microwave. You won't be lacking for entertainment with the Vizio LED TV and DVD player in the living and bedroom area plus there is a dash radio/CD player. 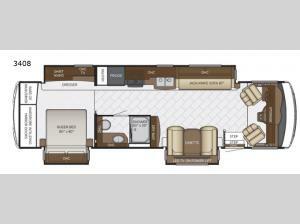 For luxury and convenience you will want a Bay Star class A motor home by Newmar! Come select your model today!